Required for effective personalization is knowing thy visitor. You can infer intent by referral campaigns and keywords, on-site searches, site navigation, wishlist activity and cart contents. Or segment customers based on profile information, device type, geolocation, new vs. returning visitor status, or past behavior. You can use the “wisdom of the crowds” to predict what a visitor will want to see or what action they are likely to take. But asking for information is an underused tactic that can help you target more creatively and effectively. You can ask for literally any information upon sign-up, but consider that additional fields make a form appear long and time consuming, and registration abandonment may increase. 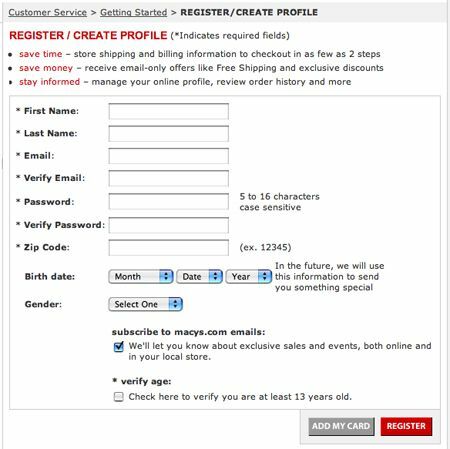 Macy’s asks for birthday information and gender, making these fields optional with a tip that suggests this information is rewarded with a birthday surprise. Even knowing just age, gender and zipcode can kickstart a personalized email campaign, which can be refined over time monitoring interest / click-through / purchase response down the road. eBags asks for birthday, and creatively, for frequency of travel in a year. It also discloses why it’s asking for zipcode, though its not clear if the asterisk implies a required field or indicates the footnote. 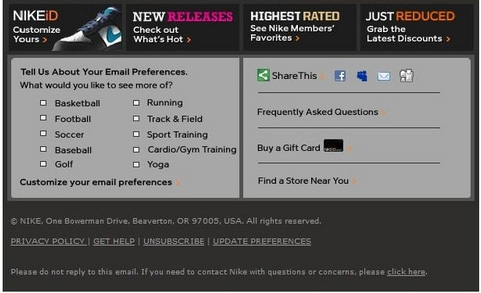 A streamlined, quick email sign up is better for optimizing opt-in email, save the details for your preference center. Art.com directs new subscribers to a preference center page immediately. Even if the subscriber abandons the page, she remains on the list. 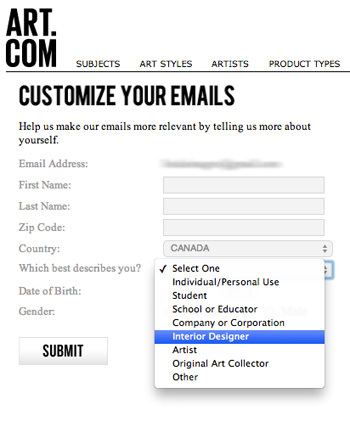 Art.com explains this information will be used to make email more relevant, and asks for self-segmentation. 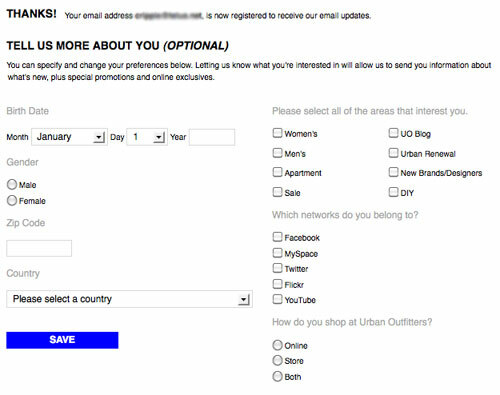 Urban Outfitters serves a page that asks for departments a subscriber is interested in, preferred social networks and shopping channels. An alternative method is to request additional information in your welcome email, but you risk that email not being open or acted upon. 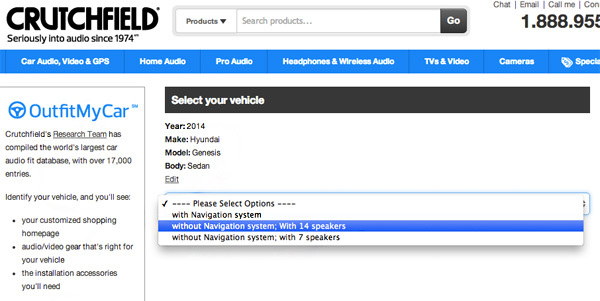 Many retailers maintain a preference center, configurable on the website. Calls-to-action to update preferences may be included regularly in emails. 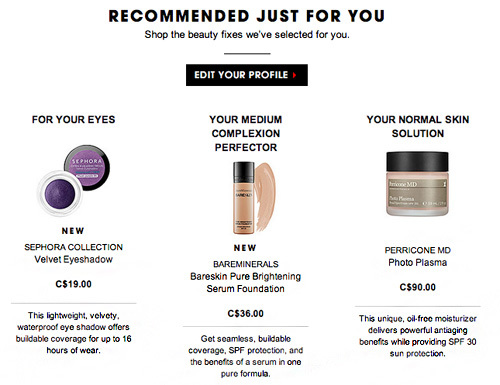 Sephora includes a prominent call to action in its emails, proximal to its personalized recommendation zone. Tip: As much as possible, persist this information to a customer’s profile to personalize on-site, not just in emails. Not only are product finders useful tools for buyers, they help you hone in on the most relevant results, and target most appropriately if a customer abandons and returns in a short period of time. Again, if you can persist this information to a visitor ID or customer profile, you can personalize in subsequent visits and remarketing campaigns. Well executed (optional) customer surveys are another great way to glean info. Request this with a site pop-up (present to visitors that return frequently and exhibit more casual browse behavior, not those that search or appear to be looking for something specific), feed through social networks, request in emails, etc. Some ecommerce sites like Shoe Dazzle build their entire site experience and merchandising on personal preferences. Don’t ask for what you won’t use in personalization. Are your merchandisers ready to use this information?